As a blogger, you’ve probably heard the term SEO many times. Maybe even worried about it, to the point of teaching yourself some simple SEO to boost your site. But learning SEO can be complicated. And staying on top of the Google’s best practices can be even more daunting. 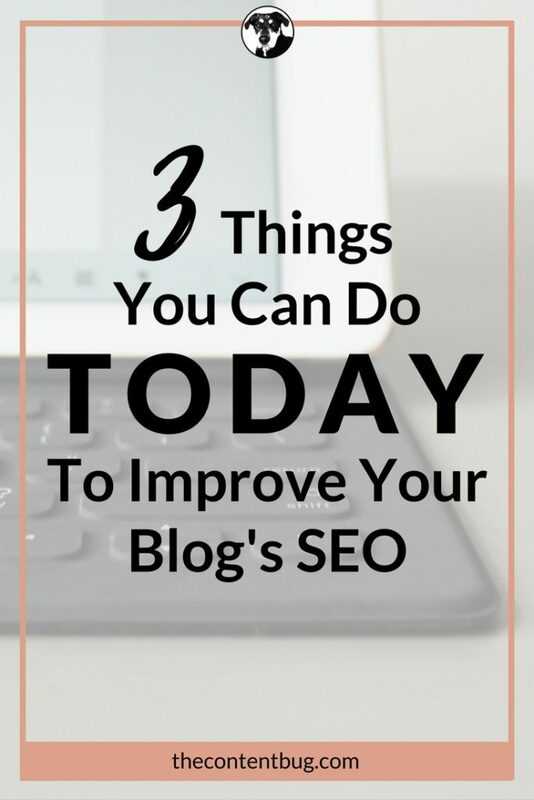 In this post, I will cover the importance of SEO and 3 things you can do today to improve your blog’s SEO in no time! Read more to learn some valuable action items you can do without an SEO or web development specialist. As a blogger, and website owner, search engine optimization is not something that can be ignored. 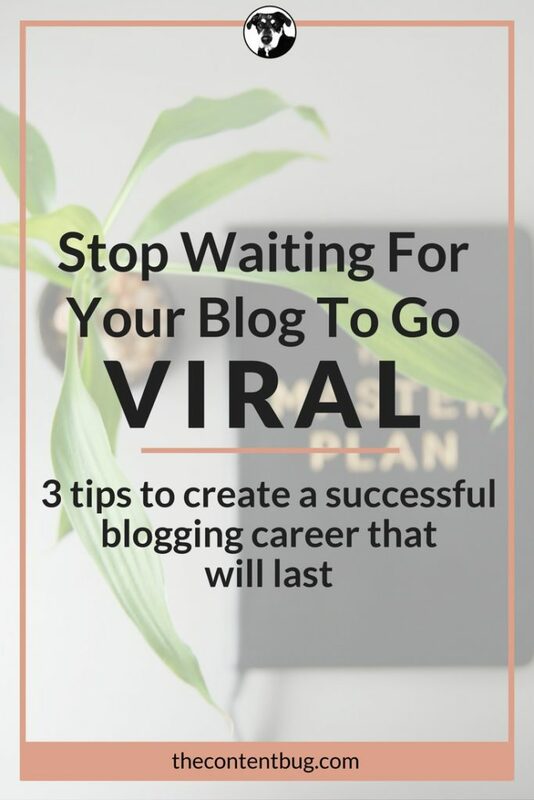 No matter how many times you share your blog post on Pinterest and Instagram, you are still missing a critical audience who is searching for the valuable information you provide. Google is the top search engine on the internet. And that will not go away. People ask Google everything that comes to mind! This one website has established themselves as the trusted advisors to millions, answering all questions thrown its way. If someone asks Google, “How do I find unique blog topics to use on my site?”, I want my blog post How to Generate Unique Blog Topics: For the Brave and Daring to appear. It’s that simple! If I didn’t focus on my SEO and only focused on my social media accounts to promote my site, I would be missing several new website visitors a day! To say the least, SEO is critical to your site, whether you know it or not. So it is time to start working on improving your blog’s SEO. 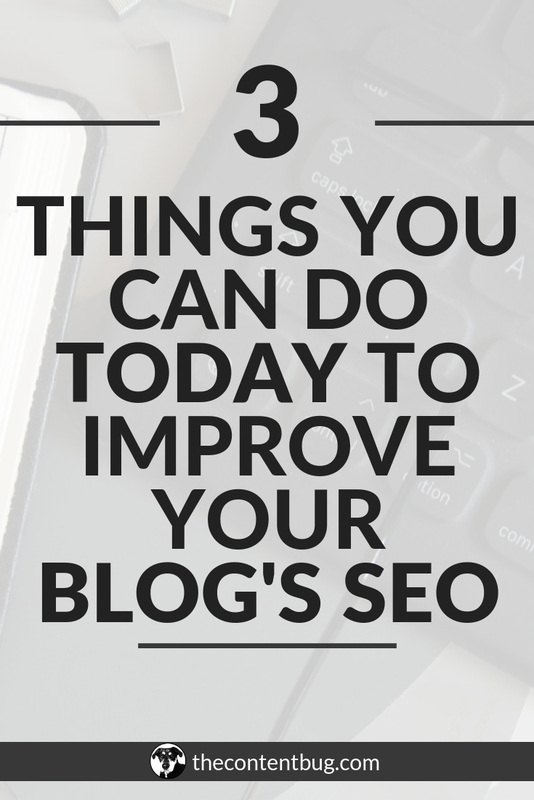 Even if you don’t do anything else today, you need to sit down and improve your blog’s SEO right now! Establishing your URL structure is simple! In fact, it will take you less than a minute to complete. But it is something that most people don’t realize is important and affects your SEO. A URL is the website address for any given page on a website. This describes the site to visitors as well as search engines. Search engines, like Google and Bing, use URLs to help determine keywords on a given page. If you have a poor URL structure right now, don’t worry! This will not make or break your site’s SEO. But the easier you make navigation and other things for search engines and users, positive SEO results are bound to follow. This is nearly impossible to read. If you know what to expect on this page, then you might have a super power. This link is okay. By looking at the keywords at the end you might be able to guess what information this page will provide. But it still doesn’t look appealing. Especially as a blogger, it is important that your posts look appealing and ‘clickable’ to readers. A simple way to do this is to edit the permalinks (permanent static hyperlink to a particular web page or entry in a blog) on your site. 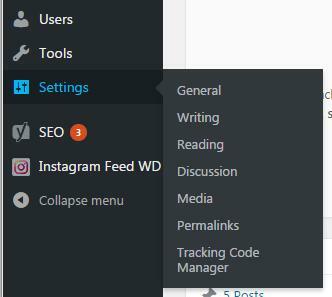 In your WordPress dashboard, there is a ‘Settings’ option on the left sidebar. Under ‘Settings’, there is an option called ‘Permalinks’. This is where you can set your URL structure! 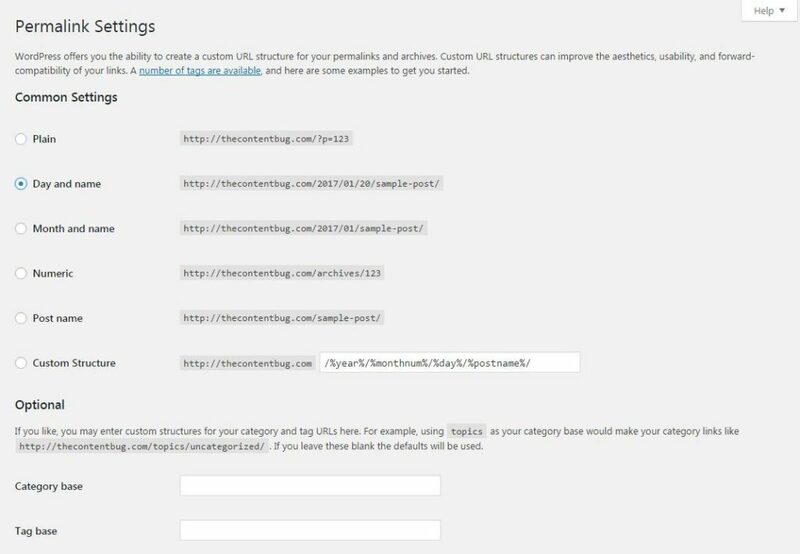 WordPress offers 5 popular structures and a custom option. The ‘Plain’ option is automatically selected for any WordPress site. But the best options to select are ‘Date and name’ or ‘Post name’. Most blogs and other websites use these 2 options. I use ‘Date and name’ because it allows the reader to know when the post was released. If a post was written in 2014 and they read it 2017, it might not be relevant if they want breaking news. 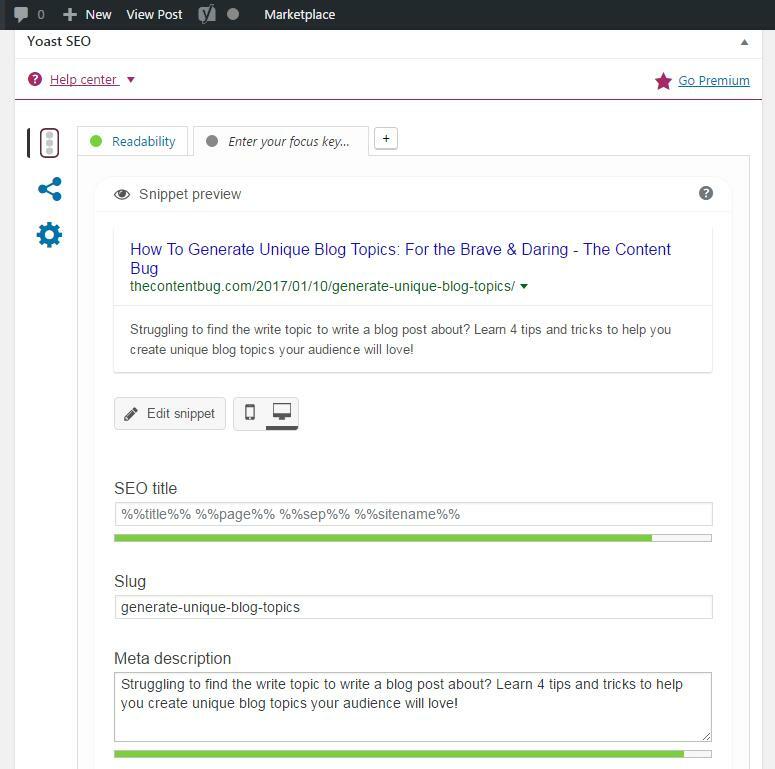 Yoast is an SEO solution that helps with sitemaps, meta tags, general analysis, and more. It is your ‘do-it-yourself’ plugin for SEO. And it is simple and easy to use! So you can complete your site’s SEO without hiring a professional. 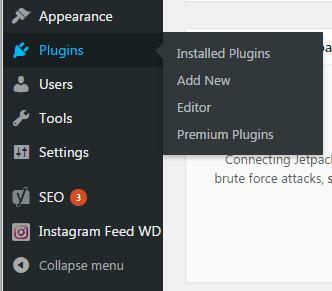 So, to manage your plugins, go to the left sidebar again and click on the ‘Plugins’ options. There are a few other options in the ‘Plugins’ tab. The 2 you want to pay attention are ‘Installed Plugins’ and ‘Add New’. If you didn’t download Yoast yet, go to ‘Add New’ and search for Yoast SEO. Then download it! It’s that simple. Once you download Yoast, there are a few areas that you need to follow up on. But to keep this post simple, I’m only going to discuss the meta description feature. It is extremely important to set a meta description for each post and page on your site! Meta descriptions are important for search engines. In 150 to 160 characters you get the opportunity to tell the search engine what the post/page contains. But remember that on some sites, such as Google, users can actually see the meta description in the results. So use this opportunity to draw readers in while also providing important keywords for the search engine. It is this section that you can change the URL and add a meta description to the page. It even gives you a ‘snippet’ preview to see how your search result would look with the title, URL, and meta description. Make sure you complete this section on every post! The bars under each section change from red, yellow, and green. Always strive to hit the green bar for all sections. This means you are one step closer to better SEO. And don’t forget to click ‘Update’ once you are done! Last, you need to optimize your images… TODAY! It is extremely important to optimize your images to improve your SEO. When I created my blog, I didn’t focus on optimizing my images from the start. I thought it would be easy to go back in and optimize my images at a later date to improve my SEO when I needed it. But boy, was I wrong! I ended up wasting a lot of time redoing work I should have done from the beginning. So if you are just starting a blog, make sure you optimize your images from the start! You’ll thank me later. Whatever stage blogger you are, if you have yet to optimize your images here are 3 tasks you need to focus on. Never upload an image to your site with the name “IMG_0154”. At all costs, DO NOT DO THIS! It is important that each file has a unique name that actually describes what is in the image. Also, make sure to include important keywords in the title. If you have an image of your desk with your laptop, a cup of coffee, and a notepad that you are using. Don’t title it “desk-image-v.1.jpg”. Instead, include some of the objects featured in the image in the title. Something like “Laptop-and-notepad-on-office-desk.jpg” is more descriptive to the search engine. 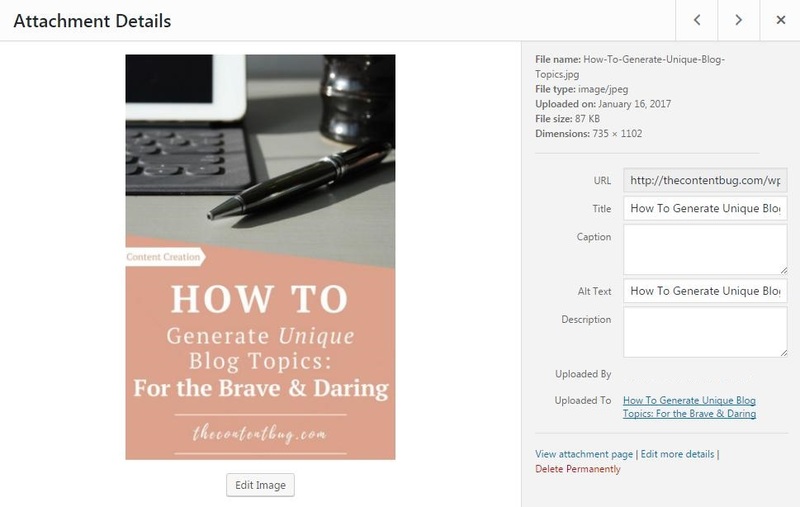 Or if you have a graphic that includes the title of your blog post, make the file name the title of the blog post. That way when people go to search for that post, the images appears in search results as well as the link to the blog post. So make sure you always change the file name of an image before uploading it. And include objects featured in the image to add a variety of important keywords to the image and your website. Websites with large images tend to have a slow site speed. There is no doubt about it. And site speed is incredibly important to your SEO! So it is critical to compress all images so the file size you upload is a lot smaller than the original. But you have to be careful not to lose the quality of the image while doing so! My favorite site to use is JPEGmini by BEAMR. The site is free to use, and it can reduce the size of a photo without losing the quality. They even provide a direct comparison of the quality of the original image compared to the compressed version. Trust me… This site is a life saver (and space saver). So go check it out! And compress your image today. Tip: I try not to upload an image to my site that is over 200 KB. The file name and image size need to be taken care of before you even upload an image to your site. Once those are done, feel free to upload the images you need! But don’t think that your image optimization jobs are over. For every image you upload, you need to add the title text and alt text. This information is what Google will sift through to determine what is in the image. So these areas as well need to contain important keywords that describe the image. The title should automatically fill in based on the file name of the image. Always make sure that this information is accurate. Then, go and fill in the Alt Text section. For some images, you can get away with copying the file name and pasting it into the alt text. But otherwise, it’s worth your time to write a 2 sentence description that entices people to read your blog post. If it is a Pinterest image, this is the description that will be attached to the pin. Alt Text: Tired of writing boring blog post after boring blog post? It’s time that you create content that your readers will actually enjoy by learning how to generate unique blog topics! In addition to the 3 things you can do today to improve your blog’s SEO, it is important that you have the following tools. If you already use some of these tools, then you are on your way to a great SEO strategy. If you don’t currently use these tools, it might be time to step up your SEO game. Google Analytics is a bare necessity for any site owner. If you have a site or are thinking about creating a site, Google Analytics is a must! Plain and simple. Google Analytics allows you to track your site’s traffic. You can see how pages are performing, what your visitors are doing on the site, how people find your site and more. Without it, you miss critical information you need to help improve the user experience for your audience. So go and set up Google Analytics today! Want to learn more about Google Analytics? 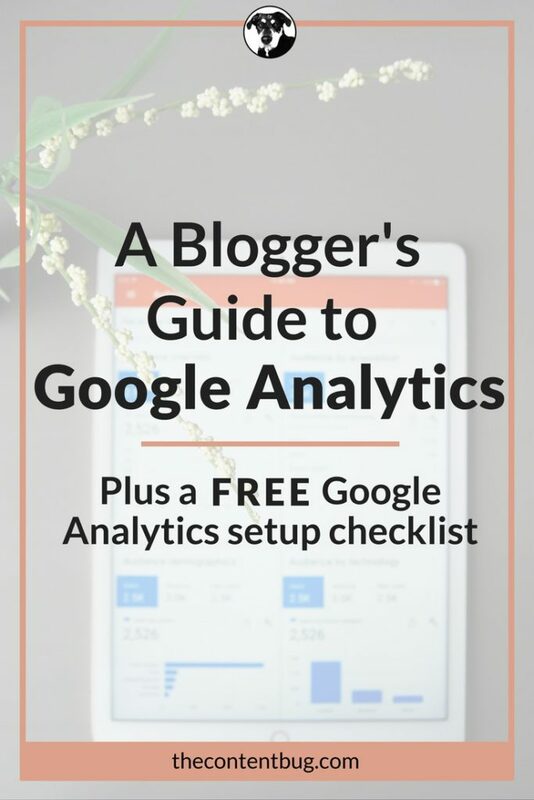 Jump on over to my Blogger’s Guide to Google Analytics! Search Console is critical to improving your organic search traffic. In search console, you need to upload your robot.txt file and your website’s sitemap. Without both of these, Google will not index your site, crippling your SEO strategy. Now, all of that might have sounded like gibberish. And that’s okay! It doesn’t have to make sense at first. 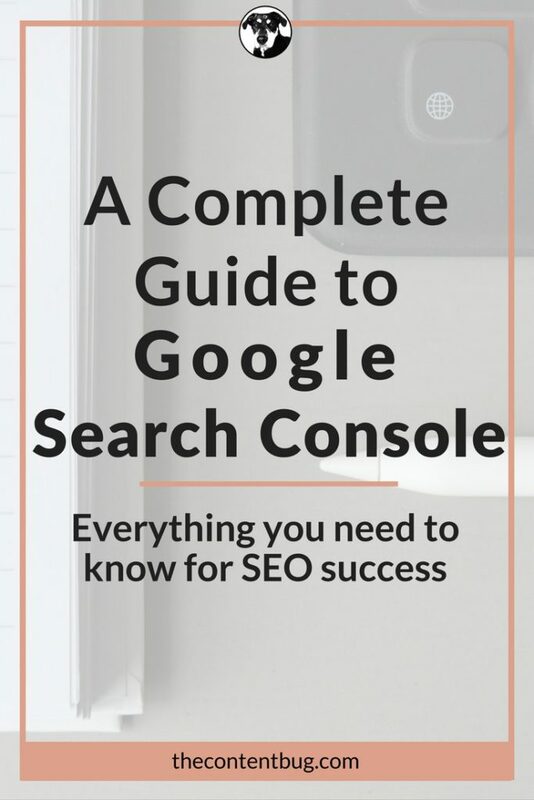 Just head on over to my Complete Guide to Google Search Console so you can become a pro today! So go ahead and get down and dirty with Search Console. Google created this online tool for site owners to check how their site is performing in relation to the mobile-friendly ability, desktop site speed, and mobile site speed. When you enter your website address into the prompted field, it will run a test on your whole site and give it a score in those 3 areas. Then it will provide feedback on what to do to improve that score. It is a helpful tool! And it is free to use as many times as you need. So go check it out today! I know... I threw a lot of information at you today. But it is important that you improve your site’s SEO every chance you get. So make sure you complete those 3 tasks to improve your sites SEO today. And also start using the 3 Google tools to help you better understand how your site is performing and where you can improve. I hope you found this blog post useful! If you have any other simple SEO tips and tricks that can help improve a blogger’s SEO today, let your fellow bloggers know in the comments below! Thank you so much for this! I cannot tell you how much this has helped me feel like I’ve FINALLY gotten things set up the way that they should be on my blog. I knew I should be focusing on making my posts more SEO friendly but I had NO IDEA where to begin. I implemented all the things you outlined above and feel a great sense of relief! Great Post! Hey Stephanie, you are so welcome! I’m glad that you found it helpful! I feel like SEO can be so daunting at first but really there are some simple things that YOU can do on your own to improve your visibility on Google. If you have any other questions, please let me know! I am not clear on how to make my SEO Title get a green light. Could you explain more? If you already have Yoast installed, and you set your permalink structure then the bar below the SEO Titles section should automatically be orange or green. But you always want to get that bar to turn green. That just means that it is up to SEO best standards! The bar that is below the SEO title section will usually start out as orange. And then once you input the title of the blog post (at the top of the page) it will change depending on how strong the title is. You may also notice that the bar will “grow” in size, aka inch closer to the right. The longer it is the better the title is! And the further it goes, it will turn to green! After you put the title at the top of the page, check to see if the bar is green. If it is still orange, it is best to go in and just change the SEO title manually in the Yoast section! When you do this, just include the title of the blog post in that section! Or most other blogs, like mine, include the title of the post and then their blog title after. So for this post, my SEO title is: “3 Things You Can Do TODAY To Improve Your Blog’s SEO – The Content Bug”. If the bar stays orange, then the title isn’t strong enough! You should take the time to look back over the title and fix it to become something people will really want to read! If you are having trouble coming up with a title that receives the green bar, you might want to check out CoSchedule’s Headline Analyzer! This will tell you where you need to improve to get the best blog post title for your article! I hope that helps! If not, just let me know, and I can get you more information. Great tips Cathrin. I always change the permalink and the url as you suggested. Thanks for sharing! Is there a plugin you recommend to optimize images that are already uploaded. I’ve been blogging for 9 years. I have a lot of un-optimized images that I need to correct. There are a few plugins that will do the trick! It depends what you need done. My top recommendation for compressing images would be CW Image Optimizer. This plugin will automatically optimize your images as you upload them by compressing the image to a smaller size. But the best part about this plugin is that it can optimize images that are already uploaded. So this plugin would work great for you since you have 9 years of photos already on your site. If you haven’t gone in and added the alt and title text to your images, that is a must! This plug in will do it for you! It is a great time saver. This will allow you to change the file name of the image based on what is entered into the Title Text area. I hope some of those work for you! Let me know if you need any other help with optimizing your images!